Hi folks! I’m back in Benin, just for 2 days, then off to Togo! Wow – it’s good to be back but, rather ironically, it’s cloudy and rainy here whilst (I’m told) it’s sunny in England: Typical!! Q: Octopuses have blood which is what colour? And the winner was: The Rev.Caroline Hewlett. Benin may have had lots of lovely trees (such as this one), but one we certainly didn’t have is the horse chestnut tree. (i) Find a horse chestnut tree (less commonly known as the Aesculus hippocastanum). (ii) Open one of the spikey seed pods to reveal the brown conkers (or horse chestnuts). 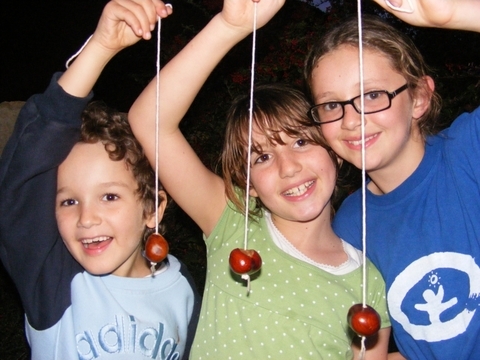 (iii) Make a hole in your conker and thread string through, tying a knot in the end afterward. (iv) Time for battle! 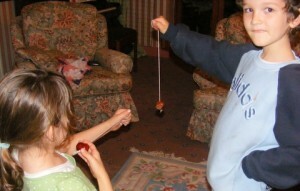 One person holds their conker on the string, whilst the other uses theirs to hit it. (v) Swap roles, so that the other person gets to hit. (vi) Battle ends when one of the two conkers breaks and falls of the string. For all you need to know on conkers and conker-fighting, visit this excellent site, which also talks about conkers in other parts of the world.